The IC-A14 series is the ideal flight companion for the student pilot. This radio practically pays for itself by saving pilots both engine hours and fuel during preflight communications with the tower. 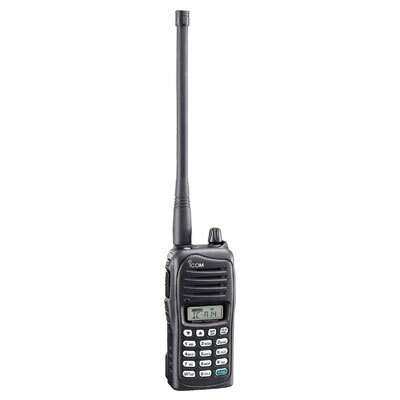 Because air band radios are usually operated in high-noise environments, it is essential for the radio to provide loud and clear audio. The IC-A14/S series employs a BTL amplifier that doubles the audio output, offering loud and clear audio thatll cut through cabin or tarmac noise. The IC-A14 series is compact (only 120mm tall) and light weight (approx. 350g including antenna and BP-232N). The water resistant construction, equivalent to IPX4, provides reliable operation in wet conditions. With the 2000mAh large capacity Lithium-Ion battery pack, BP-232N, the IC-A14 series provides stable output power and 18 hours long (approx.) operating time*. The BP-261, battery case takes 6 AA (LR6) alkaline cells for convenient battery backup.